Nice looks, right size, quiet operation, but slow ice making could be a problem. Door and cabinet shelf spacing is not very flexible. If you use a lot of ice (more than ~50 – 60 cubes a day), this is not the unit for you. Read the details below. One week ago we replaced our 25 year old Amana 22 Cu. 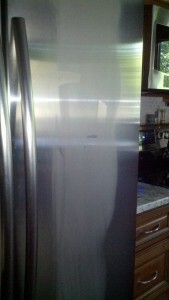 Ft. side by side with this Samsung RSG257AARS state of the art refrigerator. The Amana was still working great, but we just renovated the kitchen with new stainless steel appliances and it had to be replaced. We wanted the counter depth model because the new standard size was at least 4 inches deeper than our Amana and would stick out too far into the kitchen. The cost premium on counter depth sizes was averaging about $500 over regular side-by-sides, but we did not have a choice but to go with a counter depth unit. We had seen the sale price at $1709 five months ago and knew it wouldn’t go down any lower when we recently saw it again. As I write this, the price is $2070 today! It was delivered 5 days later and it fit perfectly under the 24″ deep wall cabinet that was 68-3/4″ off the floor. This critical height delayed our original purchase because the specs are different than actual hinge height at the door. I hooked up the water line because the installer said there was some corrosion on the fitting and he didn’t want to be responsible for any water leaks. I was OK with that. It was powered up and getting cold before the installer left. It had that “new car” smell from all the new plastic inside. I washed the entire interior with dish detergent on a sponge, rinsed it off and dried it. The smell was improved. The water filter was brand new and needed to be purged of all the carbon dust. I did this by running 2 gallons into a pitcher and dumping it down the drain. The water was grey-looking swamp water until it flushed. I hoped I purged the water in time for the first ice cubes but just in case, the first two productions of ice went down the drain too. I have great tasting water in my area and I never needed a water filter. At $40 each, and the recommendation to change every 6 months, it adds $80 per year to the cost of running the refrigerator – more than the annual energy cost estimate. I found on Samsung’s website that the water and ice will work without the filter. Placing food in it was sort of trial and error. While it is larger than our old 22 cu. ft. Amana, the shelves are less adjustable (more on that later). It looks like there is plenty of room, just that the awkward size between shelves makes it harder to fit things close to the way we had them. The picture shows the layout but it is deceiving. For example, the wide door shelves that hold a gallon of milk will not fit where they show the milk in the picture. So the picture must have a half gallon at that level. The wide shelves only fit in slots above the height of the vegetable bins otherwise the shelf interferes with the bins and the door won’t close. The bins are deep enough for a full head of iceberg lettuce which is better than most of the new refrigerators. The bins are easy to get in and out with the doors fully open. The refrigerator door shelves cannot be varied much from the picture’s layout. The can rack near the top could be removed or put somewhere else but then one of the other shelves need to be removed. The very top lidded shelf (for butter, etc.) is best left there because when lifting the lid, it hits any shelf placed directly above it. I wanted to swap the can shelf for the butter shelf,but they wouldn’t fit. The cabinet shelves only fit the way you see pictured with the exception of the top shelf. If you remove the wine rack, you can move the top shelf down about 3 inches. The shelf in the center is a split shelf that slides into itself to form a half deep shelf. I wanted to move that up swapping it for the one above it, but it does not fit due to the shape of the plastic at the rear. It makes for awkward storage of tall items in front of shorter items. The freezer door is largely consumed by the ice maker. I liked the 2 bins at the bottom of the freezer as they allow better organization. The Ice maker was not making much ice after 24 hours. I had to dump the first two production cycles (about 8 cubes each) because of the carbon filter dust. It made those two in the first 4 hours. Overnight, there was only 8 cubes in the ice bin or only one production cycle. Later that day, another cycle. Something had to be wrong with this. It was much too slow. I went to the Samsung support website and found a couple of hints. One was to initialize the ice maker. This was simply ensuring the ice cubes weren’t piling on top of each other causing the ice bin full sensor to trip. That wasn’t happening with this ice bin. There were some videos there, but the ice maker in the video is not the same as this refrigerator’s ice maker. The hint that worked was to hold the ice “RESET” switch until you hear a chime from the door. That seemed to work. Refrigerator door with frost on a humid day – is there enough insulation? But the bin is small – especially compared to our old Amana and it empties pretty quickly on a hot day. I don’t like ice, but my spouse does and it can barely keep up with one person’s demand. All-in-all, the huge size of the ice maker on the door does not match up to it’s production capability. We noticed on one humid day, that the refrigerator door had condensation on it, hinting that theinterior cold was affecting the temperature of the exterior. It made me wonder if the ice maker being on the freezer door was being affected by external temperature. The door panel controls are laid out well, but the ice/water dispenser trip button is under a small rubber cover that makes it somewhat difficult to push with a small glass. You’ll need to read the operator manual to get the hang of all the controls and the meaning of the display lights. A nice feature is the temperature displays. They will initially show what each side is set to then before going out, the numbers may change showing actual temperature. One issue we’ve seen is that we put a thermometer inside the freezer and sometimes it matches the -6 degrees that it is set to. If we open the freezer door a couple of times, we might see the thermometer reading at +20 degrees. The door still shows -6 but the ice cream is somewhat soft showing that it is not at -6. I get the sense that the cooling unit may be insufficient to cool the freezer if the door is opened and closed often. The walls may be well insulated and therefore not require a large capacity cooling unit. This is a guess, and something to watch further before concluding that it might not be working right. The panel will chime when either of the doors is open for more than 2 minutes which is a nice feature. The child lock feature stops all ice and water dispensing. The night light setting helps light the way, but the blue digital panel lights are sufficient locators to get you there without turning on any lights. Pros: Quiet operation, nice looks, modern LED lighting, counter depth. Cons: Ice maker is VERY slow and takes up a lot of door space, shelving is not optimal, temperature swings when in use and seems to take its time to recover. Rating: I would have rated this beautiful refrigerator higher, but the ice maker’s poor performance and soft ice cream dropped it to a 3.5. We’ve learned that hitting the “Power Freeze” button will make it produce ice faster, but this is likely affecting it’s energy-star performance.